If you’re after books with books that have as much action as they have heart, you’re in the right place. Meet SLAY – they do two things and they do them well: they play killer music and they slay killer demons. SLAY are back and this time they’re headed for Tokyo, ready to track down a hellraising demon. And when SLAY are invited on tour with a super-cool band of holographic girls, it’s Milly’s turn to step into the spotlight. When your average, 16-year old loser, Scott Tyler, meets the beautiful and mysterious Aubrey Jones, he learns he’s not so average after all. He’s a ‘Shifter’. And that means he has the power to undo any decision he’s ever made. At first, he thinks the power to shift is pretty cool. But as his world quickly starts to unravel around him he realises that each time he uses his power, it has consequences; terrible unforeseen consequences. Shifting is going to get him killed. As his obsession with discovering the truth takes him further away from anyone he cares about, his grip on reality starts to weaken. Scott realises if he can’t control his choices, they’ll control him. The country is at war. Beset by enemies within and without. And all because of the decisions changed by one boy, Scott Tyler. In this ravaged alternative reality, Scott hardly recognises himself. He's a war hero, a leader of a unit of Shifters and maybe the only one who can prevent the country's frail defences from crumbling. But all Scott wants to do is find a way back to the world he knew, without losing the girl he loves. With every Shift he makes, Scott edges closer towards oblivion. With no one to trust – not even himself – how much is he willing to risk to get home? PETRI QUINN is counting down the days till she can get on GLAZE – the ultimate social network accessed via a chip in the brain that is bringing the whole world together into one global family. But when a peaceful protest against the government turns into a full-blown riot with Petri shouldering the blame, she's handed a five-year ban and thinks her life is over before it's even started. Desperate to be a part of the hooked-up society, Petri finds an underground hacker group and gets a black market chip fitted. But this chip has a problem: it has no filter and no off switch. Petri can see everything happening on GLAZE, all the time. The crushing flow of random information swamps her senses, pushing her towards madness. Until she starts to see patterns beneath the noise and chaos. She starts to see how the network, and the man behind it, are changing people. Controlling them. Petri is faced with a choice. Join GLAZE... or destroy it. 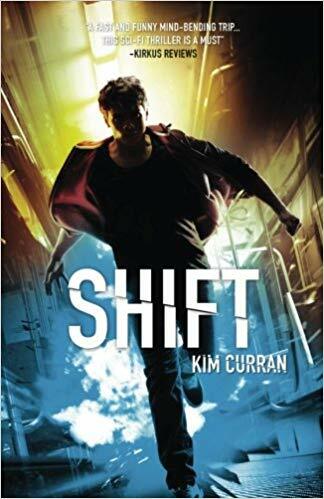 Kim Curran presents a chillingly realistic social media nightmare in this energetic sci-fi adventure.